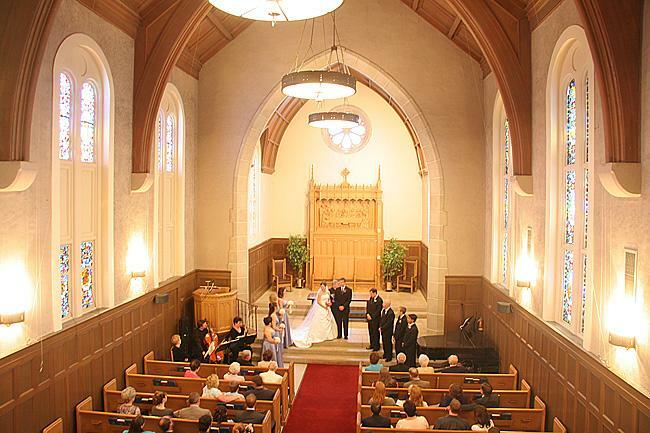 Rent Stewart Chapel | Corporate Events | Wedding Locations, Event Spaces and Party Venues. Marin County wedding locationsby Modern Bridal–Weddings, San Francisco Theological Seminary takes great pride in providing an extraordinary nuptial experience designed to create special memories to last a lifetime. Designed after the Basilica of St. Francis of Assisi, Italy, Stewart Chapel is nestled in the hills of San Anselmo overlooking Ross Valley and Mt. Tamalpais in the distance. Located at the top of a long staircase, Stewart Chapel awaits to welcome your family and friends into its cool nave. Atop the chapel building is a bell tower framed by clear blue sky and hills decorated in evergreen trees. The chimes from the bell tower can be heard for miles, seeming to celebrate with you on your special day. As one enters the chapel, a long, red carpet stretches from the vestibule to the first row of pews, creating a rich walkway for you and your wedding party. Warm, white walls and a vaulted ceiling coffered of dark wood add to the grace and beauty of the chapel. The glow and warmth of natural light shining through brilliant stained glass windows create an elegant atmosphere perfect for a wedding. Additionally, the acoustics are superb and the chapel features both a Steinway piano and pipe organ.